Robert Morris has written a great story for Mid-City Messenger about our recent flood relief efforts. Read it now. 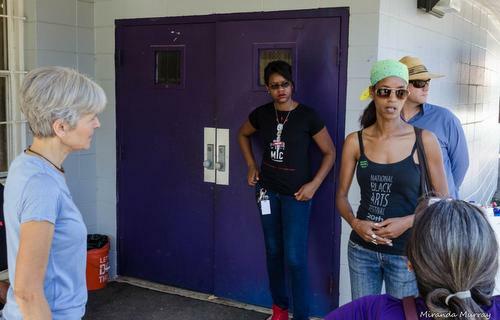 Around 10 a.m. Monday morning, Green Party Presidential candidate Jill Stein and Anika Ofori of the Green Party of New Orleans stood in the middle of a flooded-out community in Denham Springs and asked social media followers to help draw attention to the neighborhood’s plight. Three hours later, Tide announced it had arrived in Denham Springs. Local members of the Green Party learned over the weekend that Stein would be visiting Louisiana to see first-hand the effects of the flooding as part of her focus on environmental issues, said Ryan Hargis in a report on the trip at the Green Party of New Orleans’ monthly meeting Tuesday in Mid-City. At the same time, Ofori was in contact with an acquaintance seeking help for her family and their neighbors around the Lockhart Park area in Denham Springs, and that became Stein’s destination. Once there, however, Stein spent as much time learning about the uneven pace of recovery for that predominantly black community as she did other any other issue. The residents — whose street took five feet of water — had to rescue themselves, and had no visits from FEMA or other relief groups by the time Stein arrived Monday. Miranda Murray was one of the dozen or so members of the Green Party of New Orleans who traveled to Denham Springs on Monday, which also included Congressional candidate Elliott Barron and teenage Gretna mayoral candidate William Boartfield. 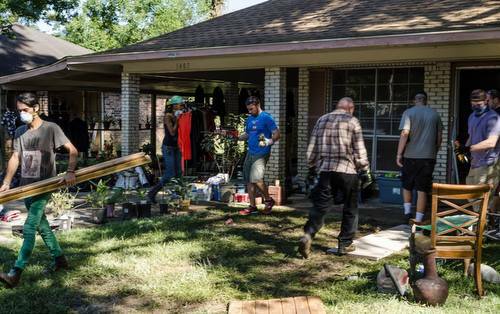 When they arrived at the Lockhart Community Center in Denham Springs, they were met by a handful of volunteers from an assessor’s office in North Louisiana, and they all went together to begin gutting the flooded home of a sheriff’s deputy. Murray said she focused on helping the wife go through her closets, a task that was increasingly heartbreaking. Murray was too starstruck by the presence of a Presidential candidate to interact much with Stein directly other than a quick photo as they left, she said, but she was taken with Stein’s “sweet,” compassionate interaction with the families in the neighborhood — even as she drew national attention to the plight of the neighborhood. National publicity aside, Ofori said she was glad the Greens of New Orleans were able to make a difference in someone’s lives.